Heavy-duty unit drives the auger through a planetary gear reduction. All moving components run in oil for constant lubrication. Spring-loaded double-lip seals guard against contamination. The reverse rotation on the PA15 allows for quick back-out when obstructions are encountered. Also helps shed dirt from the auger when working in wet conditions. Choose from a variety of auger bit styles and diameters including standard 4-6 inch(102-914 mm), 9-12 inch rock and frost (220-305 mm), and 18-36 inch (457-914 mm) tree and shrub. 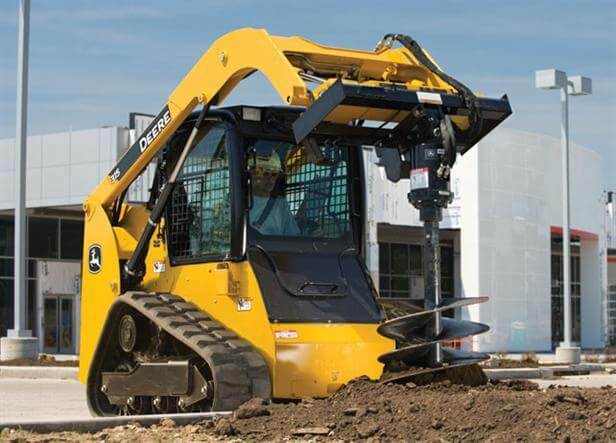 Like all Worksite Pro attachments, these breakers are optimized to work with John Deere skid steers, compact track loaders, and compact excavators, compact loaders, and the 110 TLB. In addition, they are compatible with most competitive models.